Are you looking for FUN motor room activities FOR WINTER? 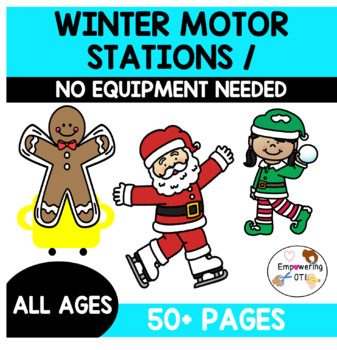 This packet is ALL YOU NEED to put up motor stations for your motor room or therapy groups for ALL WINTER LONG. Pages 4 – 21 include different motor actions with visuals that include “move your arms to make a snow angel”, “pretend to throw a snowball”, “hold a polar bear pose”, “stand like Santa”, “walk like a reindeer” etc. You can post these on walls for students to do like stations or tape them on the floor to set up like a hopscotch course. Pages 22 – 24 are motor cards. These are cards that are the smaller version of pages 4 – 21. These are perfect for brain breaks / therapy groups. Pages 25 - 33 Include activities for visual tracking / balance. 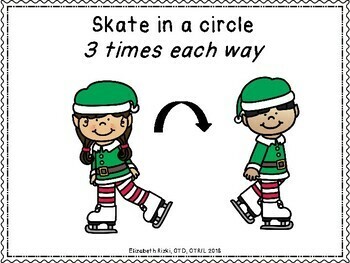 Students either stand on a balance board or on one foot, and count objects, state colors or state body parts (gingerbread person). Pages 34 – 58 include interactive pieces. For example, “build a gingerbread house”. Students bring the pieces over to match to build a gingerbread house. 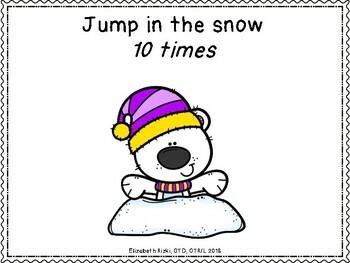 There is also one for building a snowman, tree decoration, throwing snowballs and also sequencing winter activities. Although it is just these sets, these include multiple pages to print to cut out and differentiated for using a scooter board and not using this equipment. For each of these activities, you can separate the pieces to make one pile of pieces and then the finished picture on the other side. These stations can also help to support self regulation by teaching students exercises that can be performed when feeling heightened. In addition, this is perfect for working on core strength and balance. This is perfect for a WHOLE class break, small group or individual students! Please only download if you understand these instructions. This engages students in different sensory motor strategies. This is perfect for general education students but also students with Autism spectrum disorder, ADHD, ADD, sensory processing disorder, and other special needs. This can be used with general education, RTI, MTSS, special education, occupational therapy, speech language pathology, and social work. This supports core strength, crossing midline, coordination, gross motor, and motor planning. I am a school occupational therapist who has a doctorate in occupational therapy. I work closely with special education and general education staff adapting material. This is where I get my inspiration for this material.